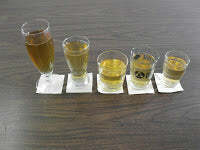 A while back I posted about a yeast experiment that used 6 different ale yeast strains to make mead. Preliminary tasting results from five Northern Brewer employees are in, I've summarized them below. Some things I've taken away from this experiment: phenolic yeast strains really don't do well at all in mead, just changing yeast strains can create unbelievably different mead, and lager strains may be a better match for meads than ale strains. Three of the five people enjoyed the Wyeast 1272 the best, and two of the five liked the Wyeast 2112. Wyeast 1272 - Dusty, sweet caramel with slight fruit and apple notes. Tart and dry with low phenolics and some alcohol presence. Wyeast 3944 - Dry, plastic and rubber phenols with some honey character. Lots of boozy alcohol flavors. Wyeast 2112 - Moderate floral aroma with a hint of mustiness. Some cereal grain notes, dark candi sugar like flavors, balancing acidity, and full body. Wyeast 1026 British Cask Ale - Light floral aroma with mustiness. Moderate peppery phenols. Flabby body with virtually no acidity and some rubbery flavors. Wyeast 3711 - Low floral aroma with moderate phenolics. Some alcohol warmth, low acid. A whiskey-like, leather component to the taste.